Fourty-six OK sailors from seven nations brought their dinghies to Oosterzee to race for the Open Dutch Championship 2017 that was combined with this years Eastersee Regatta. There were some countries we didn't receive entries from in previous editions. Tony Woods came all the way from Great Britain, Florent Delacourt and Remi Blandureau from France and Tomasz Gaj and Marek Bernat from Poland. Great they put in the effort to come to the lake Tjeukemeer. On friday evening more than half of the fleet already arrived and it looks the diner plates at the Cafe/Restaurant will become tradition. It was a wonderful evening and sitting outside we ate our plates. Some beers to go with that and then to bed. Saturday morning started sunny, warm and with a good breakfast, but unfortunately the wind forecast was not so great. The racing committee decided we would go on the water and hope the small breeze would grow to a steady wind. But all that happened was the temperature went up. And while the sun baked the sailors on their OK's, the wind didn't build up. To boost morale, the organisation handed out a 'broodje kroket' on the water. A Dutch traditional meat snack on bread. Half an hour after that, racing was postponed untill further notice and the fleet came to shore along with the racing committee. Then at half past four some breeze came in and the fleet went out for one race close to shore. At least we were racing, but still the wind was hard to find sometimes. Sunday started again with breakfast and looking out the tent directly on the waterfront. Wind, not much but wind... The race officer and his crew ordered racing to start at 10.00 hours and they immediately started to put the course in. One race, very hard because of the windshifts and winddroppings. A race with boats out of the finishing time limit. The start was tight and hard. Two boats early over the line. Thorsten Schmidt (GER) and Christian Heinze (GER). Christian was the only one to returm and start again. So Thorsten got an OCS despite crossing the finish line second. Christian managed to finish seventh despite his double start. As always the best sailors are more in the front of the fleet. Both Polish sailors Tomasz Gaj and Marek Bernat found the best wind and finished first and second. Third was 'mister consistency' Ralf Mackmann (GER). After that the wind stayed shifty, so again postponement and back to the shore. At one o clock after phoning the meteorologist, the signal came there wasn't going to be any more racing this weekend. Very unfortunate but the wind is about the only thing we couldn't control this weekend. For a national championship four races were needed to constitute a series. So no Dutch national champion in 2017 and Dirk Dame stays raining Dutch champion for at least one more year. The final ranking based on both races was made and Jörg Rademacher took the win with a 2 and a 4. Just beating Ralf Mackmann with a 3 and 3. Third was Claus Stockhardt with 9 points. Best female sailor was Susanne Mackmann ranked 11th in the final ranking. Best Dutch sailor, like last year, Stephan Veldman ranking 6th. And some special prices. Best sailor with a wooden mast, not for the first time, Rod Andrew. And best sailor with an aluminum mast, Rob Ligtenberg. Two special prices (small frisian windbags to use in their home country), to thank them for their multiple hours long drive, went to Marek Bernat and Tomasz Gaj from Poland and to Tony Woods from Great Britain. We had a good time, with nice weather, meeting friends that share a love for the OK dinghy. We learned a lot from each other and we hope to see everyone back at the other regatta's and of course next year for the fifth Eastersee Regatta during the last weekend of August 2018 ! With fourty-six entries from Poland, France, Germany, Luxembourg, Belgium, Great Brittain and the Netherlands the Dutch Championship / Eastersee Regatta looks to be bigger then ever before. The number of entries is even slightly higher than at the Spring Cup. And looking at the entry list we see 4 sailors from the just released world ranking top 20. Soenke Behrens placed 17, Joerg Rademacher placed 16 and Ralf Tietje placed 11, all from Germany will have a hard time with Poland's Tomasz Gaj placed second at the world ranking OK dinghy. For sure men to look out for. But the list is not everything. Two men to also look out for will be Dirk Dame (winner 2016) and Frank Strelow (winner 2015 and 2014). And all the other fast sailors that are a little lower on the list but have winning speed like Marek Bernat (POL), Tony Woods (GBR) and Ralf Mackmann (GER). We are sure everyone will have their opponents to race and make for a great weekend. And of course there's the question who will be the best Dutch sailor and where will he or she end up in the final results. Bring it on! The past years Francois raced his wooden entirely varnished oldskool OK-dinghy with wooden mast at the regatta. Last year his son Samuel also took an OK-dinghy and joined the fleet. He even won a special 'rookie' award being the youngest competitor. This morning we received their entry for the 2017 edition. We welcome them both back to our regatta. In some way they belong to it. Like most sailors keep coming back after their first visit. They make a fleet of 33 entries with one week of pre-entering to go till August 20th. After the 20th the entry fee will be 55 euro's. Still not a lot for entering the Dutch nationals and a free BBQ. Last week we received ten new entries now that the regatta is approaching. Earlier on we mentioned Remi Blandureau as the first Frenchman. Well he's not coming alone. His countryman, Florent Delacourt, is also on the starting list. Next to them from Germany two strong sailors, Michael Wolf and Ralf Tietje. From Belgium Joris van Baarle and the international family officialy sailing for Belgium, Rod and Jo Andrews. Also more and more Dutch are entering, with Rob Ligtenberg, Harmen de Vries and Bart ter Haar. 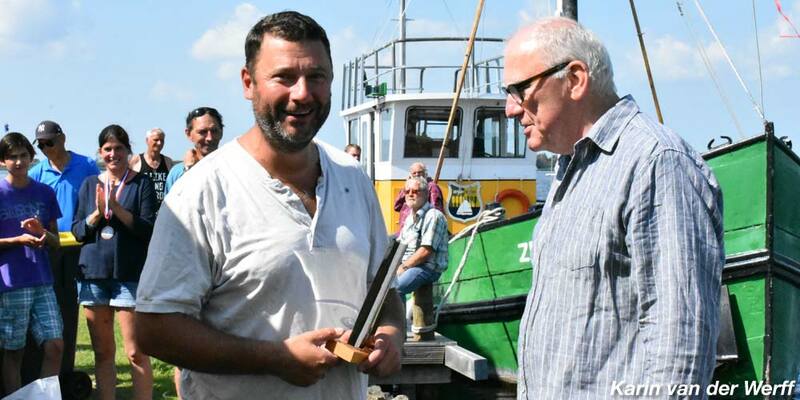 In the next few days we are counting on more Dutch sailors now that the famous Sneekweek regatta week, where Peter van der Schaaf took the trophy, has been sailed. Right now we have twenty-nine entries with two weeks to go. Promising numbers for an inland regatta ! Last week we received an entry from Remi Blandureau from France. 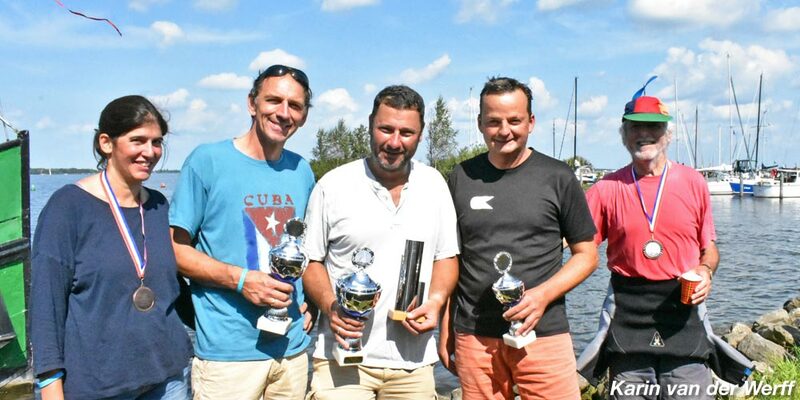 It has been a while since the French sailed at an Ok-dinghy regatta in the Netherlands. We are really pleased Remi will race with us. Here Remi is in action at the tour de lacs last april. The word is there will be another Frenchman coming too, but we are awaiting his entry. Right now we have 26 entries from 5 different nations and are expecting approximately 40 to 50 entries by the time the regatta starts, in line with the 42 entries from last year. Preparations are taking shape and entries can be made for the 2017 edition of the Eastersee Regatta / Dutch nationals. The Notice of race and the sailing instructions are available in PDF format to inform you about all the racing details. Please register for the regatta. Entries can be made through the website. The organisation would like to know how much sailors will attend the regatta to ensure a good event, so please registrer in advance if you are going to race with us. Almost april and the organisation of the Eastersee Regatta is already preparing for this international OK-dinghy regatta on the large lake Tjeukemeer in the northern region of the Netherlands called Fryslan. The Dutch OK class association has asked us to organise the 2017 Dutch National Championship. That means this years edition of the Eastersee regatta will be the National Championship just like last year and there are world ranking points to earn. After the succes of Dirk Dame (GER) winning the 2016 Dutch National Championship in an international fleet of 42 OK-dinghies, we are looking for an even larger fleet from more countries competing for the title in this years fourth edition of the Eastersee Regatta.